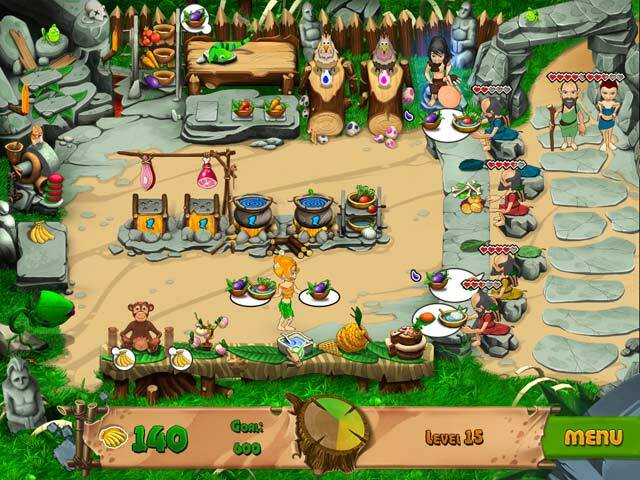 Manage your own cafe in the Stone Age era to save your tribe from hunger and earn some tribal cash in Stone Age Café! The tribe’s shaman has foretold Chuchii’s destiny: she’s going to become the tribe’s cook! What she doesn’t know is that a great cook can not only save the day, but change a whole tribe’s fate! 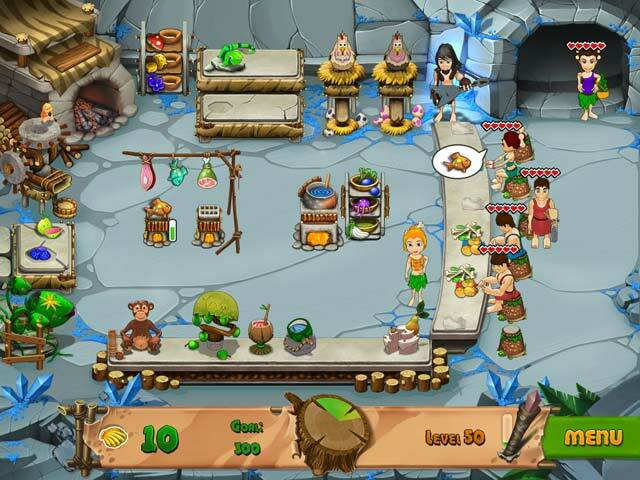 Run the Stone Age Café and save Chuchii’s entire tribe in this incredible Time Management game! 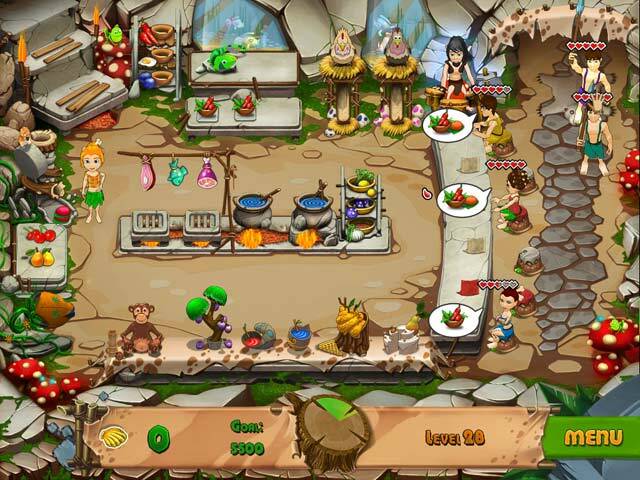 Manage the Stone Age Cafe! 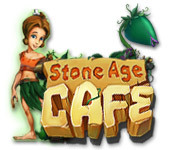 Stone Age Cafe is rated 3.4 out of 5 by 66. Rated 5 out of 5 by zownder from Addicting and Challenging I bought this game several years ago and I still play it. I love that the level progression gets pretty tough at times and that there is so much to upgrade on each different area. One of the main things that I love is the continuous play modes where you just play until you've lost a certain amount of customers. It really does get challenging! I really like the graphics in this one as well, they are cute and not too "Flintstone"-like. There are so many extras to upgrade, as I mentioned, and I love that you can buy the little music guy to help out. If you love time management games, and games like Diner Dash, then you'll really enjoy this one as well. Rated 5 out of 5 by insaneheadspace from I've replayed this game twice now! This fun time management game is set in the stone age and features newbie, casual and expert game play options, each with 60 levels of play and 3 types of cafes. Really cute stone age kitchen upgrades and food. I've played this one through twice now, and I will definitely come back to it again! Rated 5 out of 5 by biblereader1611 from Great Time Management Game I really like this game.....although instructions were a bit limited...took a few tries and losses to figure out how to make the hamburgers.....strategy is there and the level of difficulty is about right...playable but might take a few tries to beat some levels. Very cute game and works fairly well. Keep the TM games coming ... please!! Rated 5 out of 5 by LuckyHappy from Very fun game I bought it. becuse the trial was very fun. The game begin easy but for every level it been harder. Rated 5 out of 5 by msbear78 from I like this game. Much like the dash games, I really like this game. Gives me a break from Diner Town but still offers the same fun. I love TM games!! Alway a good way to relieve stress!! Rated 5 out of 5 by stepanovb from Fun!! Really liked this game. Quite fun, very addictive gameplay. Try it, you will like it. Rated 5 out of 5 by tweetybird_18428 from Lots of fun. This reminded me of Diner Dash. My son was laughing when the guys were brawling, that was his favorite part. I will be buying this game soon. I loved the fact that it lets you skip levels if you don't complete them. Rated 5 out of 5 by taniushk from It's so fun! I had a good time playing game Stone Age Cafe. Everything looks very nice. Food looks tasty. Cute animals. Easy playing and good music. I want more games like this one! Have a good time everyone! Rated 5 out of 5 by Kage13 from Nice TM! A really nice and funny TM. Probably the first TM as far as I remember having a storyline connected with levels - like someone stealing stone seats, weird fellows in black with a message for our hero, stone-age 'office workers' who ruin economy of the tribe... the plot and humor makes this game give a unique feeling. Difficulty is just the right for me.